Death Path társasjáték - Magyarország társasjáték keresője! A társasjáték érték! A Death Path egy kiváló társasjáték, 2 - 6 játékos részére, az átlagos játékidő rövidebb, csak 20 - 40 perc. A társast, 13 éves kortól ajánljuk kipróbálni. A játékmenet erősen épít az egyidejű akciók, a kockadobás és a játékos kiiktatás mechanizmusokra. Death Path is a race to the end of a maze with 2 or more "Subjects" taking turns simultaneously. 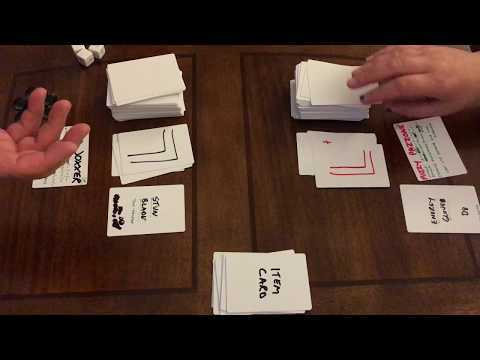 To navigate through the Death Path, Subjects will reveal cards at the same time. Much of the Death Path are clear paths but occasionally you will run into a choice with multiple options. This will cause your deck to split in hopes of finding a quicker path to the end. You may also encounter Pathfinders, crude government-control cyber-dudes trying to slow your progress. There are weapons.... and you'll need them! Each time you reveal a 'Stash' card from your Maze Deck, you will draw and Item Card and have the option to equip it. Each weapon you find will have a custom die associated with it. D8's for one-handed weapons and D12's for two-handed weapons. They are custom and not numbered traditionally. The number on each side indicates the damage inflicted if you hit. Some weapons, like the volatile Fusion Staff, have low and high damage results representing more risk/reward while others like the trusty Power Nux are more consistent with the damage they inflict. The first Subject to finish revealing all the cards in their Maze Deck is the winner. If any Subject loses all their Health tokens, they are dead and out of the game. In a two player game, this means their opponent wins. 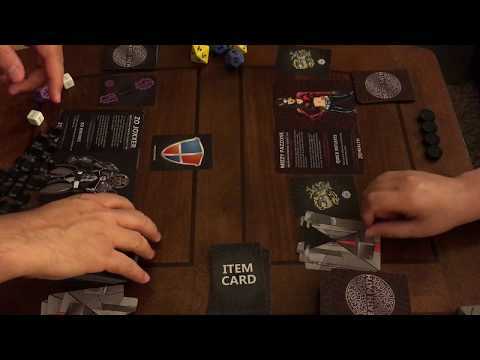 In multi-player, the others keep navigating through the Death Path until there is a winner! A 2 player game takes approximately 20min to play, while adding additional players can increase that to 30-40min.